Kite flying is such fascinating sport that the three typical kites here given will make one want to build others, larger and of different shapes.Kites have been made large enough to carry a man high in the air. The adjustments of a kite are so subtle that much patience is sometimes needed to make it fly. That is why the rather elaborate bridle is suggested for the paper covered kite with tail. It will require a little longer stay in the workshop, but it will save time outdoors. To make the spine and crosspiece, saw a 1/4" strip from the edge of a 7/8" straight-grained spruce board 3 ft. long; then saw this strip again lengthwise, and plane the two pieces 3 ft. × 3/8" × 1/4". Mark the center of the crosspiece and a point 8" from the top of the spine, and plane each end tapering thinner to 3/16". In each end saw a slot 3/16" deep,(see diagram). Glue and bind securely the middle of the crosspiece to the 8" point on the spine. Notice that the last few strands go around the others. Test the sticks to see that they are square with each other. This can be done by measuring from one end of the spine to each end of the crosspiece. Put a cord that will not stretch around the ends of the sticks, in the slots, and tie it tightly. Bind this cord into each slot in such a manner that it will not slip, and at the same time wind the sticks so that they will not split beyond the slot. While doing this, one must measure again from each end of the spine to the ends of the crosspiece so that the two halves of the kite will be equal. Cover the kite with strong, light paper. Glue the paper to the sticks, and fold it over the string 1/2". Try to have the string lay in the crease of the fold. Strengthen the corners with another piece of paper, 2" wide. To make an adjustable bridle, wind a cord twice around the spine near its top and tie it tightly on the front side, keeping the knot in the middle. Little holes will, of course, have to be made in the paper. Cut the cord about 2" long and tie a bowline-knot. Measure on the crosspiece 10" from the center, and down the spine 12" from the crosspiece, and tie three more such knots. Double two cords, about 40" long, and tie them in one big knot, called the flying-knot, to make a loop about 1" long to which to fasten the anchor line. Mark a point on the spine 10" below the crosspiece. 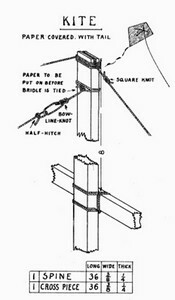 Hold the flying-knot here, and fasten two cords to the loops on the crosspiece with two or three half-hitches (see diagram). Now bring the flying-knot 2" above the crosspiece and out from the kite far enough to make these two cords taut. Fasten another cord to the loop at the upper part of the spine. Adjust the remaining cord as taut as the others. A flat kite like this always needs a tail, and the most bothersome tail ever made is that familiar kind made of paper and string. To make a convenient, serviceable, and easily-made tail use strips, 3" wide, of bunting, cheese-cloth, or any soft, light cloth. In a high wind a longer tail is needed than in a light wind. If the kite seems too unsteady, pull it down, and try to adjust the bridle or the tail, before an accident occurs. If the kite dives, let go the string just before the kite reaches the ground so that it will not strike the ground with force enough to smash the kite. When letting out string rapidly, always protect the hand with a cloth or glove lest the string cut thru the skin. If in doubt about the strength of the anchor-line, two boys can very quickly test it 100 ft. or so at a time as it is being let out; one does not want the string to break when the kite is high in the air.